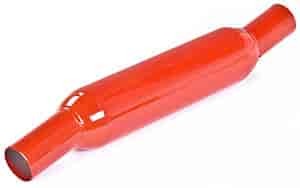 Cherry Bomb Glasspack Mufflers are the original high-performance Cherry Bomb muffler that provides a classic muscle car rumble. Glasspack Mufflers maximize horsepower and torque by untilizing a straight-thru design that delivers high frequency sound and flow. Each muffler features 100% welded construction with Cherry Bomb's exclusive red paint for lasting durability and a show quality finish. All glasspack's are reversible and have a compact body size for flexibility of installation on most all cars and trucks. These are universal mufflers. you can measure the pipe size and the area they will be mounted to see if they will fit.